Thinly sliced raw asparagus, scallions, almonds, and herbs in a ginger-sesame dressing make a vibrant, crunchy spring salad. 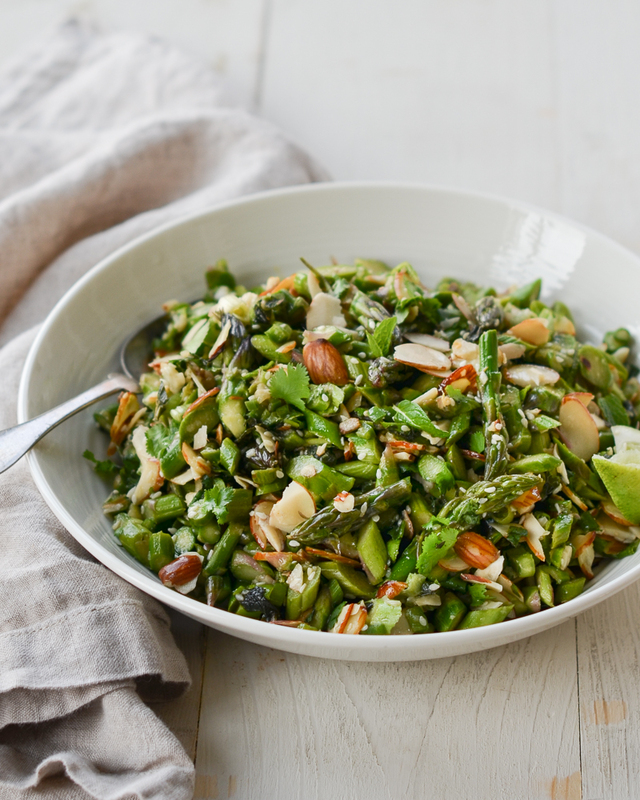 In this vibrant spring salad, thinly sliced raw asparagus is tossed with scallions, almonds, fresh herbs, and a spicy Asian-style vinaigrette. It’s cool, crunchy, and a welcome change from the typical roasted or grilled asparagus. Instead of shaving the raw asparagus into long, thin ribbons, as it’s done in restaurants, I slice it on the bias into thin bite-sized pieces; it accomplishes the same thing and is much easier. Serve this salad as a side dish with any Asian-flavored fish, chicken, or steak entrée. Or try adding leftover chunks of salmon, shrimp, or pulled, smoked chicken to make a more substantial dish. The salad is best made a few hours ahead of time, so plan accordingly. Begin by prepping the asparagus. Snap or cut off the tough ends of each asparagus spear. Cut the asparagus on the bias into very thin slices (about 1/8-in thick), leaving the tips intact. Next, in a mixing bowl large enough to fit all of the ingredients, make the dressing: combine the rice vinegar, vegetable oil, brown sugar, soy sauce, lime juice, sesame oil, ginger, garlic, and jalapeño. Add the sliced asparagus, scallions, cilantro, mint, and sesame seeds to the bowl. Toss well, then taste and adjust seasoning with salt, if necessary. Refrigerate for at least 2 hours or overnight. When ready to serve, stir in the almonds and then taste and adjust seasoning (you will likely need to add more lime or rice vinegar, as the flavors mellow). Transfer the salad to a serving bowl and serve cold or room temperature. For more asparagus salad inspiration, check out my Grilled Asparagus Salad with Lemon & Feta and my Asparagus Salad with Creamy Dijon Dressing and Hard-Boiled Eggs. Enjoy! In a mixing bowl large enough to fit all of the ingredients, make the dressing: whisk together the rice vinegar, vegetable oil, brown sugar, soy sauce, lime juice, sesame oil, ginger, garlic, and jalapeño. Snap or cut off the tough ends of each asparagus spear. Cut the asparagus on the bias into very thin slices (about 1/8-in thick), leaving the tips intact. Add the sliced asparagus to the mixing bowl and toss with the dressing. Add the scallions, cilantro, mint, and sesame seeds and toss again. Taste and adjust seasoning with salt, if necessary. Refrigerate for at least 2 hours or overnight. When ready to serve, stir in the almonds and then taste and adjust seasoning (you will likely need to add more lime or rice vinegar, as the flavors mellow). Transfer the salad to a serving bowl and serve cold or room temperature. Note: When handling jalapeño peppers, be sure to keep your hands away from your eyes and wash your hands immediately afterwards so the juices don’t irritate your skin. This is such a delicious salad. The dressing is so balanced in flavours. I didn’t have spring onions so substituted for half a shallot finely chopped and roasted the almonds. It was just perfect. Thank you Jenn for another amazing recipe. I made this salad for Easter brunch. I made the recipe exactly as-written. It was delicious. I could drink the dressing and will probably use the dressing for other recipes. I will definitely make it again! We made this tasty salad last weekend and served it with the cedar planked grilled salmon with ancho chili rub (out of the Once Upon a Chef cookbook!). I substituted avocado oil for the vegetable oil, and reduced the brown sugar to one tablespoon. The flavors of the salad are super fresh – the mint and cilantro are essential- and the textures are nice. I may lightly toast the almonds next time. It was the first time we had ever eaten raw asparagus, as my grandmother always told us that it was poisonous if not cooked, but obviously an old wives tale as this was over 50 years ago! Thanks for a great recipe that will be added to the springtime rotation. I made this tonight for a potluck tomorrow and the flavors are amazing. Used 1lb asparagus and 1/2 lb sugar snap peas, forgot the scallions. Toasted the almonds and will add tomorrow. Can’t wait to taste it again after all the flavors have had some time together. This was great! I reduced the brown sugar as I don’t have much of a sweet tooth (also used avocado oil). I’m a little lazy so I made a double recipe for the dressing and reserved some to marinate salmon for 30 minutes prior to dinner. It worked great for a delicious, healthy meal. I also made Jenn’s warm couscous salad for another meal during the week. It worked well to plan on those two meals in the same week as it used up the mint and almonds. How long in advance can this be made? I’d like to make it and serve 2 days later. Will it be okay to sit in the refrigerator for that long? Hi Leslie, I’d say 2 – 3 days max. Just keep in mind that the flavors will mellow as it sits in the fridge, so you will likely need to add more lime juice or rice vinegar. Hope you enjoy! Would this go well with honey baked ham and your strawberry orange salad? Or would a different asparagus dish work better with the flavors? Hi Linda, I think this would pair nicely with the fruit salad, but not so sure about the Honey baked ham. How about this recipe for Sauteed Asparagus with Peas or, if you’d prefer something that can be made ahead, how about this one? Hope that helps! I made this beautiful salad and it was scrumptious. Since I do not use Vegetable Oil or brown sugar, I omitted them from the recipe. It did not make a difference because everyone loved it. The sesame oil was perfect. Every flavor stood out and was so fresh tasting. I highly recommend trying this recipe. You will be glad you did. Going to serve again at Easter. This was absolutely wonderful! I’ve been looking for new ideas for side salads and this caught my attention. I served it with grilled chicken and everyone loved it. It did lose some flavor by the next day but I just added some more vinegar and lime juice. Yum! It’s really pretty too. Delicious! We enjoyed this as a side with chicken and rice and the next day we ate the leftovers from this asparagus salad on top of a bed of spinach. I didn’t have all the ingredients on hand so I substituted apple cider vinegar for the rice vinegar, substituted olive oil for the vegetable oil. My family does not care for cilantro or mint, so I omitted these. I think next time I will add a little extra jalapeno but otherwise will make exactly the same as this time. I loved having such a healthy and tasty way to serve one of my favorite spring vegetables. Excellent salad and a nice change from the usual lettuce/olive oil dressings. I decided to parboil the asparagus for a minute so it wouldn’t be too crispy and it came out perfect. I also wanted more crunch from the almonds so I used blanched slivered almonds instead of the thin sliced almonds. The dressing was excellent and refreshing with the mix of mint and cilantro. It also kept nicely overnight in the frig so we ate it for two days which you can’t do with most of the leaf lettuces. Also used apple cider vinegar instead of rice vinegar. Served with grilled rib eye! Happy to find a delicious fresh salad to add to my rotation. I served this alongside lightly pan seared ahi tuna on a bed of lettuce and it was a hit! The dressing really makes this salad special. The only change I made a was a touch of tahini in place of the sesame oil. As usual, my guests asked me for the recipe! Easy to make and a light side to accompany a sandwich or meal. I did not have a jalapeño, so used a pinch of red pepper flakes, but should have added more. The brown sugar made the salad a bit sweet for Mt taste, so I would reduce its quantity. I love the flavor of sesame oil! Marinating this salad in the fridge for hours or overnight really helps blend the flavors. This recipe was in last week’s newsletter and I couldn’t resist making that night even though my entire family was out of town. I just had to try it! I made an entree salad out of it by adding some left over salmon to it. Love the Asian/ginger vinaigrette and the raw asparagus cut into small bites was super simple and delicious. No need to worry about over cooking! (I’m not a fan of mushy asparagus!) I plan on serving this at Easter dinner and I also have a pot luck dinner in a few weeks that I’ll bring it to. It’s a mice make ahead recipe. Thanks Jen for another great recipe! I am a huge fan! I served this with seared fresh ahi tuna – everyone loved the combination and the salad was a hit. Jenn’s clear step by step instructions were perfect as usual. Easy to make – fresh and delicious! This salad was so quick and simple. Everyone at my dinner party loved it! I toasted the almonds to give them some extra crunch. Also, be sure to use younger/thinner asparagus – almost the whole stock is tender. I recently made this recipe as a side to Jenn’s pork fried rice dish. Since I didn’t have time to marinate the asparagus in the dressing for so long, I decided to lightly steam the asparagus for about 3 to 5 minutes (depending on thickness of the asparagus). Then I drained and rinsed in cold water. I cut the spears as directed. I also did not use mint since I did not have any on hand. This recipe is delicious and adds a slightly different spin to serving asparagus. Definitely a hit! It is so good that I decided to bring it as a side to a friend’s Passover dinner next week. I took this to a potluck today and it was devoured by all! It was a little more sweet than is my personal preference, (I may reduce the sugar to 1 tbls to try next time,) but it was awesome. Not spicy, just vibrant and crisp and another total win from Jenn! Just made this as a side dish to complement a flank steak I had marinated in lime juice and garlic and some other Asian flavors. Really easy and delicious. I am already thinking about how many times I’ll make this over the next few months. Another winner! Thanks Jen! would this salad be ok with oven bbq ribs. I season the ribs and serve bbq sauce on the side. This salad looks so good. I do think it’d be good, Bernice. Delicious! I have never had asparagus raw and this was a revelation! Keep the recipes coming! Another home run. Was thinking, probably won’t make again as I was prepping. I had to toss much of my asparagus as not in season (duh). So only made probably 4 servings and had dressing left over. We served with Sriracha Pork Meatballs from BHG – skillet meals (and twice cooke rice). Nice as the recipes used many of the same ingredients : cilantro, ginger, green onions, sesame seed. Amazing. Thank you for another fabulous recipe! Yes! Yum! I was a little skeptical about making a salad from raw asparagus, but it is really good. I love the touch the mint adds and the crunch of the almonds too. Will also be a great dish to bring to summer potlucks/picnics. Another winner, Jennifer – thank you! Totally enjoyed! The mixture of flavours and textures was wonderful. Definitely adding this recipe to our summer meal planning. Made this yesterday morning to have for dinner and I must be honest, it did not look very appealing to the three of us at the table but we decided to still give it a try and we all really liked it. I did blanch the asparagus for 2 minutes and then transferred to ice water as I don’t like raw asparagus or broccoli and I would do that again as texture was still firm and perfect for it. My son, who is vegan, said he would add brocolette and garbanzos next time to make it a meal. Although I measured and weighed everything carefully, the dressing is liquidy so we felt it needed to be served on a small bowl vs flat dinner plate as dressing was running to rest of food or just use slotted spoon to serve. Not sure if that is how it is supposed to be or if I should have just put less dressing on it. Jen, you are a master! I love making yummy good food and you rock my world! I am going to sell my collection of decades old Cajun Cookbooks and other old school ones as well. You seem to have boiled down food prep and presentation and it’s many beautiful ways to be presented and enjoyed! I love the gift that you have and the incredible way you simplify how to cook properly. I have studied thousands of hours but your way of boiling it down is simply magnificent! Your recipes never fail. Thank you!!! I made a half recipe of this salad tonight as I often do with new recipes. It disappeared in minutes. It’s a keeper! I als love the way that you write the recipes to minimize the number of dishes needed. How often have I whisked the dressing in a separate bowl and then pored it over the greens anyway. Could avocado or evoo be used in place of the (Wesson) vegetable oil? Want to stay away from canola oil…. I like vegetable oil here because it’s very mild tasting, but you can use EVOO or avocado oil if you prefer. Hope you enjoy! Hi Margaret and Jenn. 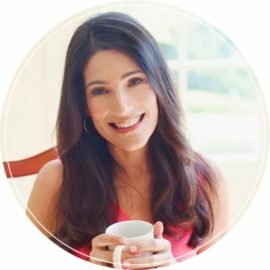 I used avacado oil in mine and loved it! Should the aspargus be blanched or is it served raw? I am very excited to try this salad.